The distortion seen here is not in the picture but the landscape. Standing on the saddle of the divide between Malgosa and Awatubi, looking south to the next saddle of Awatubi Crest and then to Sixtymile -- the next drainage along the Butte Fault Route and the objective for the day. Making the necessary distance between water is the critical factor, assuring Still Spring at Lava Creek will be within reach for the next day. Looking upstream from the Butte Fault area. 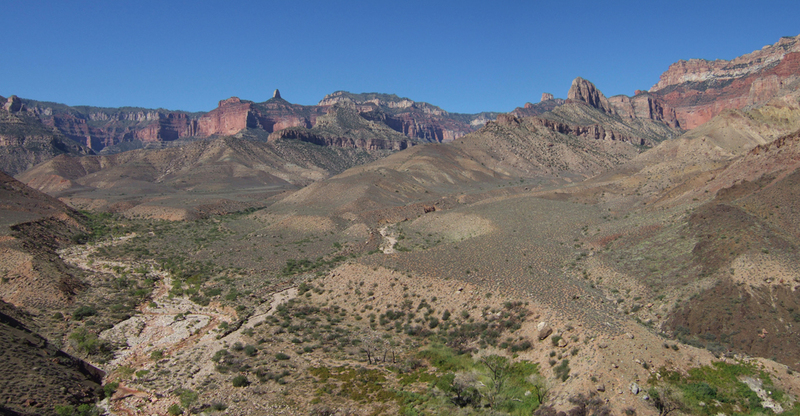 Tilted Mesa Trail joins the streambed at the lower right corner. High points on the skyline are Mount Hayden and Marion Point. The extensive drainage system captures enough rainfall to cause frequent high-flow and flash-flood events that move things around, clear streamside growth, and reroute creek flow. Everytime I visit, the place looks different, former campsites are gone, and water sources require rediscovery. But the really big cottonwood marking the trail junction remains in place. 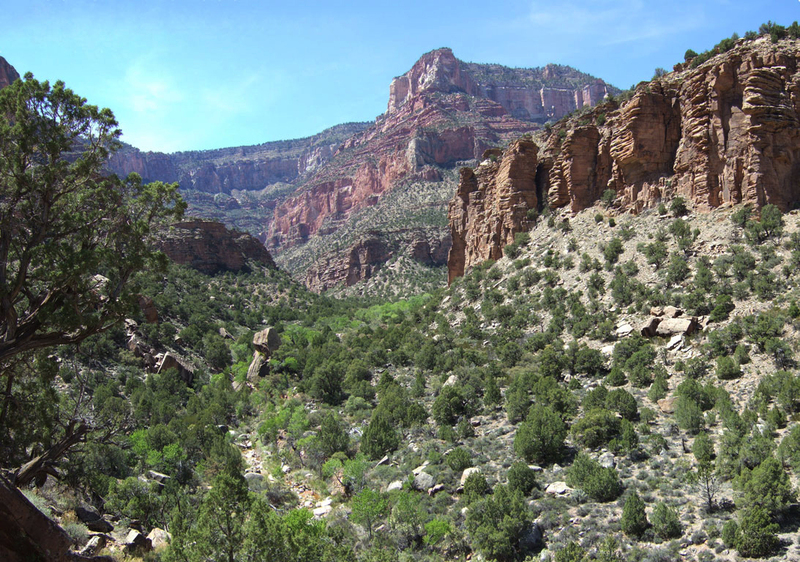 The Lava, Chuar, and Carbon Creek drainages form a large open space between the Butte Fault on the east and the Walhalla Plateau to the west. 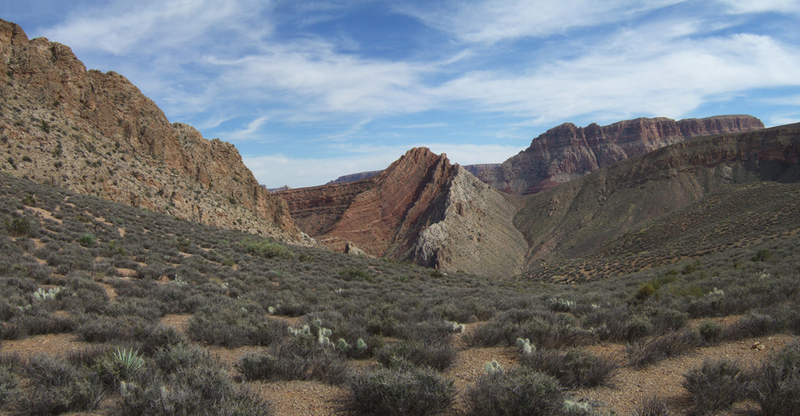 Unusual Supergroup geology makes this an interesting area to explore. Huge stranded stromatolite boulders can be found all over the valley. In this photo at a bend in Lava Creek, narrow brightly-colored layers make a striking image. 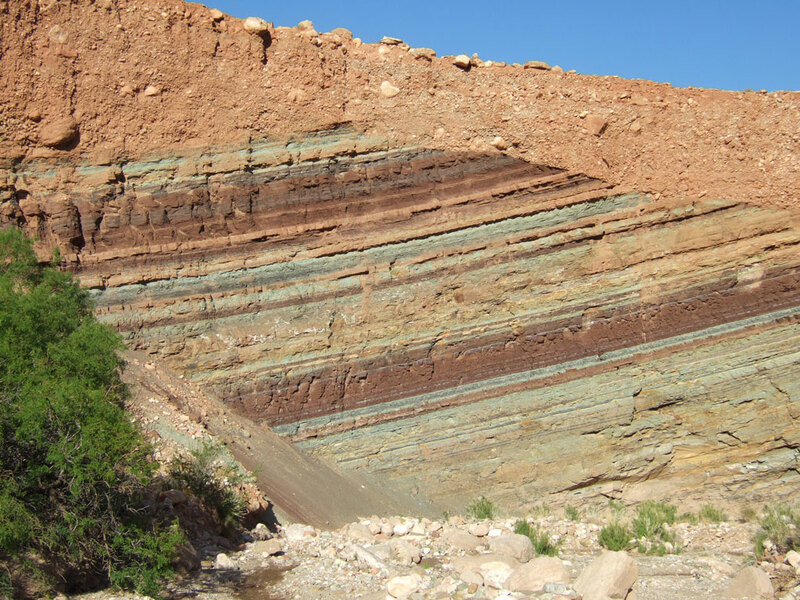 Extensive mud/rock cemented debris rests on top of these alternating shale bands, and similar material can be seen above either bank along nearly the entire length of the stream. It's a geologic mystery. This view is from far up Lava Canyon looking onto a broad basin area where the stream flow emerges from a rock rubble layer filling the bed. Naji Canyon joins from the left of the view with the Walhalla Plateau rim on the horizon. Near the middle-left of the photo an enormous slab of Tapeats sandstone stands up out of the bed and makes what I call the "Monument to Water" where the spring flows from the base of this slab. Very nearby, an extensive Anasazi dwelling site is located under a convenient sheltering overhang. "Wow, look at that." We are up on the slope opposite Cheyava Falls looking for a stone-wall ruin site hidden in the trees, the dark green foliage and white snow making a dramatic contrast. 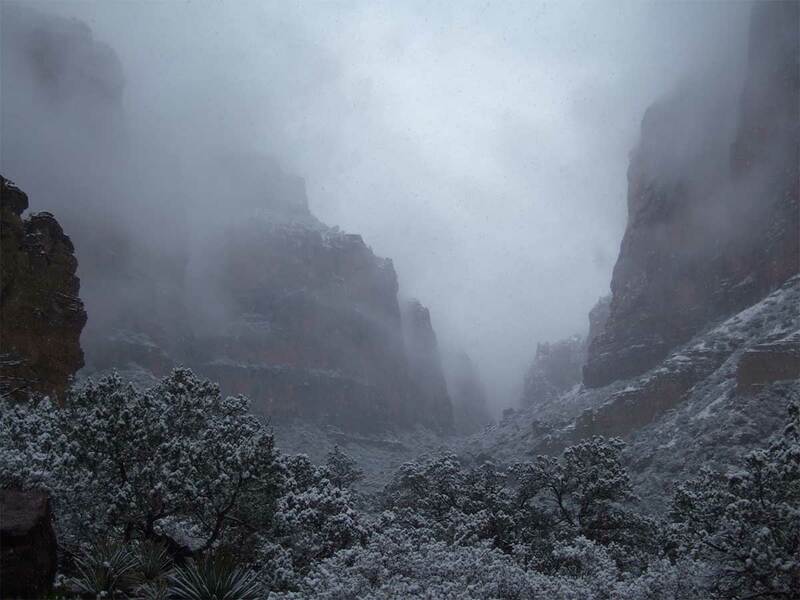 Just at that moment the snow falling lightly around offers a clear view up-canyon to the North Rim, snow falling heavily there and shrouding the Redwall cliffs. What a great view! !